Muggles can travel back and forth between two lands, Hogsmeade and Diagon Alley, located in Universal Orlando's two parks by taking the Hogwarts Express. The train ride is more than a conveyance, however. It is a highly themed and evocative experience that offers a seamless transition and cleverly stitches together a unified Wizarding World of Harry Potter. Type of ride: Train ride with some dark ride features. Location: One-way trips depart from both Hogsmeade at Islands of Adventure and Diagon Alley at Universal Studios Florida. Important boarding info: Passengers must have a two-park ticket in order to ride the Hogwarts Express. Could you handle it? There are some brief moments aboard the slowly moving train during which the lights flicker, and mildly scary events can be heard taking place. One of the iconic moments in the Potter books and films takes place when Harry makes the journey from London to Hogsmeade, the Scottish location of the Hogwarts school, aboard the Hogwarts Express. Visitors to Universal's Wizarding World can take the same journey. 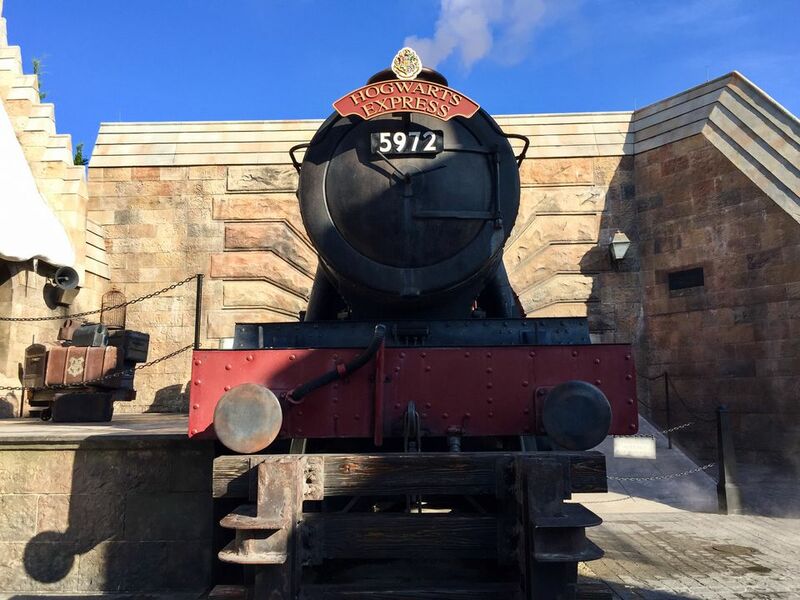 While the trains travel in both directions (and offer two different experiences), I'd suggest mimicking the story and making the London-to-Scotland trip for your first Hogwarts Express ride. To reach the train at Universal Studios Florida, guests head over to King's Cross Station, a faithful adaptation of the London landmark. An old fashioned ticker board noisily updates the arrivals and departures at the busy station, although there is no mention of the clandestine Hogwarts Express which is known only to wizards (and muggles in the know like us). A long hallway leads to a cavernous waiting room, complete with a working snack bar, where guests navigate a maze of line switchbacks. Eventually they make their way upstairs to the station's tracks. How, you may wonder, does Universal enable visitors to experience the pivotal Potter moment of running through the brick wall between Platforms 9 and 10 to reach Platform 9¾? It's accomplished using the Pepper's Ghost effect, one of the oldest mirror tricks in the book (the same effect that Disney uses in the Grand Hall sequence of the Haunted Mansion). Guests in the queue can see the people in line in front of them seemingly vanish through the wall. When it's time to make their own way to the platform, however, it appears to would-be wizards that they are merely entering a darkened corridor. Aside from an audible "whoosh" sound, there is, regrettably, no attempt to reproduce the magical, molecule-shifting phenomenon. Entering Platform 9¾ is a goosebump-inducing moment (one of many throughout The Wizarding World). The cavernous station, with its casually strewn luggage, conductors in their crisp uniforms, and hordes of passengers eager to board the train, looks like it was lifted intact from the film—one of the benefits of retaining key members of the Warner Bros. creative team who crafted the movies to help design the parks. There is another round of chills when the train huffs and puffs into the station. With its carefully aged and weathered appearance, the Hogwarts Express is also note-perfect, with one notable exception: Lacking a turntable, the engine enters Platform 9¾ facing backwards. That looks weird and momentarily, um, breaks the spell. When it leaves the station bound for Hogsmeade facing forwards however, all is well in the Potterverse. Guests are directed into eight-passenger compartments that look exactly like the one in which Harry first met Ron and Hermione. The conductors shut the doors in the well-appointed cabins and with a hearty blow of its whistle, the train chugs out of the station. The compartment's window is actually a high-definition video monitor. The media is synchronized to match the movement of the train and show the scenes that roll by as it makes its way from the bustling city of London to the Scottish village of Hogsmeade (and vice-versa for the inbound trip). It is not 3-D, but the imagery is crisp and, for the most part, realistic. I believe that the monitor is mounted a few inches away from the window to help give an illusion of depth. The train rocks a bit, as trains are wont to do, but the footage maintains the same perspective thereby taking riders ever so slightly out of the story. Characters from the films make cameo appearances during the ride, and eagle-eyed fans will note familiar story elements along the way. (Beware the dementors!) Not all of the action takes place outside the window. The compartments' doors double as video screens as well. A couple of times during the trip, guests can hear a commotion happening in the corridor and see characters in silhouette as well as their hands (and in one hilarious case, a face) smooshed up against the frosted glass panels. At certain points, the train's lights flicker in tandem with the action. It's a clever use of the entire compartment as a storytelling space. The entire experience is clever. "You wonder how they did it," says Robbie Coltrane, one of the film's stars who was on hand to celebrate the expanded Wizarding World at a pre-opening media event. Coltrane's character, Hagrid, has a couple of scenes in the attraction. "The entire train ride is only about four minutes long, but you feel like you've been on a real journey," he says. I'm not sure exactly how Universal did everything, and the ride's designers have kept some of their tricks close to the vest. Thierry Coup, senior vice president of Universal Creative, did reveal that there are two Hogwarts Express trains which constantly shuttle guests back and forth between the two parks. Since there is a single track with a brief section of double track at the halfway point, the trains have to leave the stations at precisely the same time and travel at the same speed so that they can safely pass one another. Universal's cleverness extends beyond its creative prowess in designing the attraction. By making it an integral and compelling part of The Wizarding World, most guests would want to ride it to get the complete Potter experience. By making it an inter-park ride and requiring a two-park ticket to board it, Universal will surely help up-sell a lot more more customers to higher-priced passes, encourage multi-day visits, increase demand for its on-property hotels, and drive business at its CityWalk dining/shopping/entertainment district. In fact the Hogwarts Express has played a pivotyal role in changing at Florida's theme park calculus. There are no thrill ride features as there are in Harry Potter and the Escape From Gringotts or Harry Potter and the Forbidden Journey, nor are there any animatronic characters like the impressive goblin tellers in the lobby of the Gringotts ride. But the Hogwarts Express is a grand-scale attraction and one of the 12 best rides at Universal Orlando. It will delight both Potterphiles and more casual fans and immerse them to an impressive degree in The Wizarding World. Call the Ministry of Magic! What's Next at Potter's Wizarding World? How Intimidating Is Carowinds’ Intimidator Roller Coaster?